The cost of providing prescriptions has gone up by 25% in the last decade, with an ageing population and new drugs part of the reason. NHS figures show the total bill for 2017-18 was £1.3bn, which is 25.7% more expensive than 10 years ago. Paracetamol and aspirin are among the most commonly-prescribed drugs. In Glasgow, the average cost of prescriptions is about 8% higher than the Scottish average. The data, from the Information Services Division of NHS Scotland, said the overall cost amounted to £248.79 per person. In the NHS Greater Glasgow and Clyde area, Scotland's largest health board, that figure rose to £271.30 per person, while NHS Orkney had the lowest average cost at £206.28 per person. 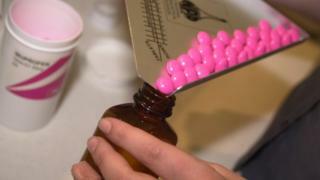 Prescriptions have been free in Scotland since April 2011, a policy introduced by the SNP government. The figures showed 103.4 million items were dispensed on prescription in 2017-18 - an increase of more than a fifth over the last 10 years. Pregabalin, a drug used to treat epilepsy and chronic pain, had the highest total gross ingredient cost in 2017-18, at £36.38m. The most commonly-prescribed medication was omeprazole - used to treat indigestion, acid reflux, and stomach ulcers - with a total of 3.59 million prescriptions issued. Painkillers paracetamol and aspirin - both of which are available over the counter without a prescription - were the fourth and eighth most commonly-issued prescriptions, at 2.5 million and 2.01 million respectively. It also explains that there has been a shift from secondary to primary care for a number of high-cost medicines. The Scottish government said the figures had not been adjusted for inflation, but inflation would be a factor on the value of drugs in the global pharmaceuticals market. Scottish Conservative shadow health spokesman Miles Briggs has responded to the figures, saying he's concerned: "With drugs such as paracetamol and aspirin often cheaper to purchase over the counter, we need to ensure that we are getting value for money for our NHS." Labour health spokesman Anas Sarwar said: "As more Scots continue to live longer, prescription costs are almost bound to rise due to more people living with long-term conditions that require treatment. "This presents challenges not only for prescriptions but for a range of other services such as social care and GP practices. "Labour continues to call on the SNP government to use the powers of the Parliament to give our NHS the funding it needs to end the staffing crisis in our health service." Scottish Health Secretary, Jeane Freeman, said: "The increase in costs for drugs dispensed in the community is in line with anticipated trend and reflects the fact more patients are being treated closer to home with specialist medicines traditionally reserved for hospital. "These new treatments deliver better outcomes for patients and are best value for money for the NHS, however we expect NHS Scotland to always look for opportunities to work with pharmaceutical companies to reduce the cost for drugs wherever possible. "Supply issues, an ageing population, increasingly complex health care needs, more people living with long term conditions, and the impact of the volatility in the value of the pound in recent years are also contributory factors to increased costs." She then added: "Legislation controlling what the NHS pays for medicines and supplies is currently reserved to the UK government and we are continuing to press them to ensure we can get best value."